Today, we begin posting the entries in the first annual I Must Be Off! Travel Essay Contest. Each entry will at first appear without a byline or bio. These will be added at the end of the contest. We have received lots of entries, so we'll be posting one every other day until all the entries meeting the guidelines have been published. Please feel free to comment on the essays and give your support, but remember to be constructive if you offer criticism. These writers are my guests. The Isle of Seil isn’t a very popular Scottish island. In fact, a lot of Scottish people have never heard of it. It’s not very big, nor particularly small. Its scenery isn’t terribly dramatic – gently hilly but not mountainous, rural but not isolated. Its biggest selling point is its convenience, as it’s linked to the mainland by a wee hump-backed masonry bridge. You can drive over the Atlantic and be on Seil in less than a minute. 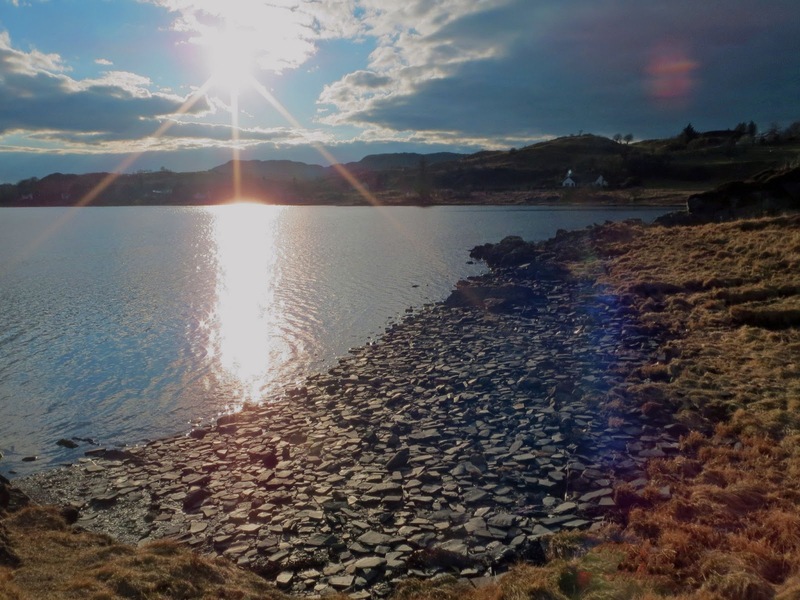 Seil is covered in slate, with big, grey chunks of it lining its shores. They are good for skipping on the water and excellent for smashing. I amused myself one evening by picking up pieces of slate and throwing them down on top of other pieces of slate, where they smashed into many pieces. My friend shrieked when I tossed a chunk of slate too close to her head, but soon she was throwing slate too and giggling when it cracked at her feet. Soon all of my friends were tossing pieces of slate into the air and watching them break on the shore. The sound was tinkly, almost musical. We felt bold. This was ‘our’ beach, at least until we had to leave the next day. We’d discovered it by jumping over the fence that surrounded our holiday cottage and walking across the farmland towards the sea. It was tucked away behind a mound of earth covered in gorse and an oddly-shaped rock. There were houses dotting the other side of the coast, but they were too far away to hear our smashing and laughter. We were alone. It was cold but the sun was bright as it started to set, forcing us to put on our sunglasses. We looked ridiculous in our coats and wool hats with our trousers still rolled up to our knees from afternoon rugby matches or misguided attempts to go wading, but it hardly mattered. This was our last trip together. Most of us were North Americans who had been living in Scotland for years and our visas were running out, forcing us to go back to places that had become foreign to us. This frustrated us because we knew that this was where we belonged – in Scotland, on a cold, rocky beach, tossing slate in the air and drinking out of blue plastic cups. The cups were something of a tradition. They came with us on every trip and we always took them out and filled then with a token amount of booze in a scenic setting. The cups weren’t about getting drunk; they were about ceremony. We couldn’t help but think they might be lucky. 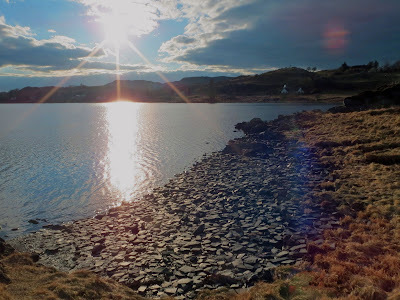 We’d had multiple days of blinding sun on our trips to the isles of May, Inchcolme, Arran and now Seil, which is rare in a country where the sun only shines 25% of the time. The drink of choice this year was Arran Gold, which we’d discovered on our last trip to the Isle of Arran. We sipped our drinks, appreciating the sweet creaminess and the bite of the single malt whisky, and raised a toast to the sea. We laughed because it was easier than the alternative. The next day we would wash our blue cups, sticky with Arran Gold residue, and pack them into our backpacks for the drive back to Glasgow. Some of us would soon be shoving them into suitcases when we moved halfway across the world. The cups would be there to remind us that were in Scotland once, where island holidays require both scarves and sunscreen, and it was brilliant. Katie Dickerson works as a web content developer and writes in her free time, so she spends most of her day staring at a computer screen. She has published several short stories and has won the Telegraph 'Just Back' travel writing competition. "It was cold but the sun was bright as it started to set, forcing us to put on our sunglasses. We looked ridiculous in our coats and wool hats with our trousers still rolled up to our knees from afternoon rugby matches or misguided attempts to go wading, but it hardly mattered." I can easily visualize this scene and I'm giving a lighthearted chuckle. I felt cold and sorry they had to leave.